Al Lomas, CMP, CMM, CFE, CEM with Certified Consulting Service has a longstanding relationship with IAEE’s CEM Learning Program, which has benefitted greatly from his contributions over the years. He serves as an outstanding international ambassador to the CEM Learning Program, with a very strong presence abroad. Al’s dedication to enhancing IAEE’s international presence is well-known among industry members and CEM students alike, with many CEM graduates praising him for his commitment to the program. Al is also a regular contributor to the CEM Faculty Training program at Expo! Expo! and, of course, teaches various courses throughout the U.S. on a regular basis. He has also contributed his expertise for updates to the CEM course materials. Al’s dedication and commitment to furthering IAEE’s education objectives earned him the IAEE Bob Dallmeyer Educator of the Year Award in 2016. Here, he talks with IAEE about teaching domestically versus abroad and his approach to facilitating the IAEE CEM Learning Program. Awards presentation during the Networking Luncheon at Expo! Expo! IAEE’s Annual Meeting & Exhibition 2016 in Anaheim, CA. From left to right: Representing the IAEE Awards Committee, Randy Bauler, CEM; Al Lomas, CMP, CMM, CFE, CEM; and IAEE President and CEO David DuBois, CMP, CAE, FASAE, CTA. IAEE: You have facilitated IAEE’s CEM Learning Program in Azerbaijan, Canada, China, India, Mexico, Korea and the U.S. What do you enjoy most about teaching classes across various borders? AL: It is important to recognize that when teaching in the USA or in another country, one has a responsibility to three different entities; the CEM candidate, the licensee and IAEE. IAEE has placed its confidence in me to present the course while the licensee has paid thousands of dollars for my airfare, meals and lodging. Failure to communicate the content and the concept of the body of knowledge is not an option. In preparation for my new assignments, I spend weeks in preparation. The majority of the preparation for an international assignment begins with the research for a better understanding of how expositions are produced in those countries. To me, preparing for the class is the most enjoyable part of any course. I prepare by researching the licensee, the top five expo centers, the class roster and reading about the top 10 shows in that country. The execution of the class is also fun – and the most exhausting portion of the course – as it is being taught in the student’s second language. Another fun challenge is learning the customs of the culture; from business card etiquette, bowing when introduced and never making a student feel uncomfortable by asking a student a direct question to which they may not know the answer. IAEE: These are all very different regions with very different cultures. What similarities do you come across in your students and what differences really stand out to you from region to region? AL: The students around the world are similar to the U.S. audience in the respect that they are all are adult learners, and hungry for education and the knowledge of best practices. All students want to succeed, advance their careers and be more valuable to their sponsoring organizations. The fear or apprehension of the unknown and being tested regardless of borders is the same from country to country. In other countries, especially in Asia, the students are very focused. They read the modules in advance of the class and study during their breaks and lunch. The challenge for me is that, in international classes, the mix of students may include a significant number of educators (professors and Ph.D.s) from colleges or universities where the majority of their exhibition industry experience is more in theory than in practical experience. The questions, understanding and thought process of educators is very different from those students working events on a daily basis. The common mix of an international class will include educators, venue suppliers, organizers and hotel managers, but mostly project managers with substantial experience. And, though all speak English, not all are fluent as it is their second language. I must choose my words wisely, talk slowly and completely forget using metaphors. It is sometimes difficult to understand verbal responses from the table group representative when reporting their conclusions of a case study. Another major difference is that in the U.S., we teach utilizing more experiential methods while abroad the lecture method is more acceptable with a smaller amount of experiential teaching. 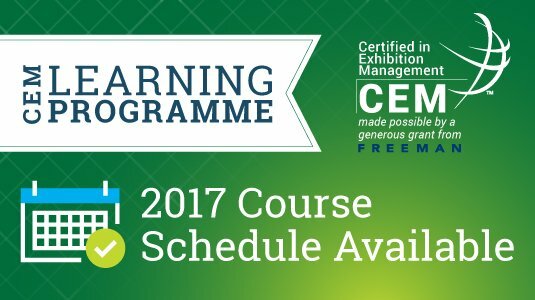 IAEE: You’ve been teaching CEM courses for over a decade. How would you compare your teaching experience now to when you began? AL: Years ago, the accepted process of teaching CEM courses was to provide lectures mirroring the PowerPoint and the content of the module. Approximately six years ago, a decision by the CEM Commission and IAEE education staff was made to make our classes more student-centered than teacher-centered, and to begin using proven alternate methods of adult instruction based on experiential teaching methods. Though this was nothing new to the teaching world, it was different to the CEM Learning Program. After some serious faculty training, we tested it and the instructors adopted the new method of training. Each instructor is given the latitude of deciding how much experiential teaching (learning from each other vs. learning from the teacher) to use. I continue using a mix of lecture and experiential teaching with no specific formula. Each of my class presentations is tailored to the subject, the country, the audience mix, the job titles, the experience in the room and strategically decide how to proceed for that one day. Many will say I am “old school” and responsible for killing many trees, but my many handouts and quizzes are essential to my method of instruction. I teach by reinforcement: you read the term in the module, you hear the term verbally, you see the term on the screen, the term appears on the quiz and then someone verbally answers the question. Repeat, repeat, repeat and then you put the terms into practice in a group exercise, but only after the concept has been explained and understood. Anyone can explain a term, but not everyone’s explanation can be understood. Success is measured by the evaluations at the end of the day and I am only as good as my last student evaluation. IAEE: What is your favorite CEM module to teach and why? AL: Security, Risk and Crisis Management is my favorite module to teach. In teaching this module my 32 years of venue, concert, special event, meeting, sports and exhibition experience become part of the class experience. I share my experiences after the students have shared theirs. My intention is to make sure the student knows that it is the responsibility of each employee of the organization to be involved with attendee safety, the threat of crime and loss of property. We think about crisis, threat analysis, mitigation and decision-making all day from start to finish. I realize that all the terminology associated with contracts and insurance in the module can be very boring, so I spice it up with role playing, quizzes, crossword puzzles and multiple real-life crisis incidents. Time really flies by when you’re having fun! IAEE: You are known among your students as a very colorful, high energy instructor. What approach do you take in keeping teaching fresh and interesting for you as the facilitator of the course? AL: I never teach two classes the same, even when it is the same topic and the same module I taught last month. I enjoy teaching and preparing for each course by rereading the materials, tweaking the PPT, and developing new and fresh scenarios for the table groups to work on during the day. Learning should be fun and should relate to real practical experiences of the people in the room. I play music before class, the tables are laced with canisters of Play Doh and pipe cleaners for the purpose of creating the “Art of the Show” for the day. The atmosphere is relaxed, yet structured, for optimum learning by allowing the candidates to feel my passion for the CEM Learning Program. The most important piece of information of my class is not the module or PPT, but the class roster. I study the roster, compare job categories (organizer vs. supplier), years of experience and the number of candidates from the same companies. The candidates are strategically placed at different table groups specifically for the purpose of interaction. The dynamics of the class is hampered if I have five people from the same organization and they all sit at the same table. I observe eye contact, body language and attempt to engage those who may be distracted by phone calls, business emergencies or family concerns. Most of all, I solicit early morning feedback (formative evaluations) to make sure the audience agrees with my agenda. The adult learners in the room usually walk in with three objectives: 1) they want to pass the exam at the end of the day; 2) understand the concept of the topic; and 3) have takeaways they can put into practice the first day they get back to work. It is my responsibility to meet those objectives and to make it a pleasant experience for the CEM candidate. At the start if each class, I make a mental note of how I felt when I was sitting in my first CEM class and proceed with that thought throughout the day, and try to keep things loose. As I see it and mentioned before, I am only as good as my last evaluation. The CEM candidate or their employer paid several hundred dollars for the course, travel and lodging, and deserve the best IAEE can offer so I attempt to provide a solid performance while making it a pleasant experience for the student. IAEE: What advice would you give someone considering earning their CEM designation? AL: The most important decision regarding earning your CEM is the decision to seek the designation. Some people enjoy the online course study, while others will only do face-to-face CEM classes. In face-to-face classes you have interaction with the other candidates; networking opportunities; and, at the end of the day, your course is finished. Plan your CEM Day or CEM Week so that you can devote your time to the task at hand and not having to leave the room every 15 minutes to answer calls from work. Register for CEM Week LA on 17-21 April here! You will benefit from earning this premier designation by increasing your confidence, becoming more valuable at work and wind up possessing one more desirable trait than your competition, should you decide to seek new employment in the future. IAEE: When you won this award, you mentioned how moved you were to receive an award bearing Bob Dallmeyer’s name. How did Bob impact your experience in the industry and what makes this award so special to you? AL: Bob Dallmeyer was the consummate professional, mentor to many, an icon in the exhibitions industry and generous with his time to others. He was respected for his understanding of the exhibitions industry worldwide. He was known as a man of high integrity, leadership, honesty and character. As an educator, he was known as a great presenter and teacher of the CEM Learning Program. All any of us in this industry can do is to follow his example. When Bob walked into a room most knew who he was and, if not, soon wanted to meet him. In his presence when talking with you, he made you feel you were the most important person in the room. I miss him; and as an individual, he was just one great guy! IAEE is accepting nominations for the 2017 Bob Dallmeyer Educator of the Year Award! Click here to learn more about the IAEE Individual Awards and submit your nominations today! Are Digital and Face-to-Face Marketing Frenemies?